Some people have Mardi Gras, others have Carnavale. 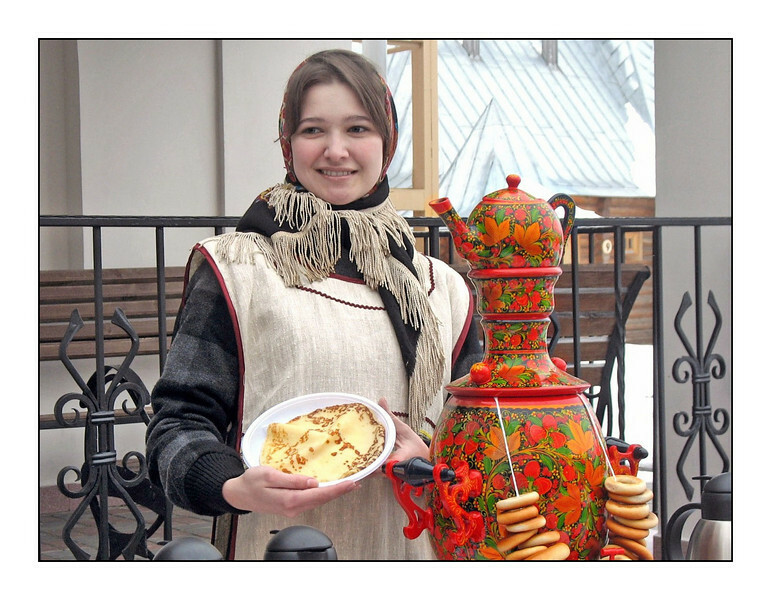 Russia has Maslenitsa, also known as Pancake Week. Originally a pagan festival celebrating the end of winter, today's Maslenitsa is a time of [over] indulgence before the start of Lent, and a celebration of the end of winter. The pancakes (blini in Russian), which are more like crêpes, symbolize the sun. Let's hope they'll be an early end to winter this year. The samovar with the teapot on top is done in traditional Russian style known as Khokhlama. Love this shot and the back story!!! Really great shot & good background information that adds to the beauty of the capture. Love it! A beautiful image and informative commentary, thanks for sharing it, I missed it when you posted it. Beautiful tones, pretty girl - like how that teapot pops against the subtlety of the rest of the shot. Interesting tradition so well documented! and letting us know about this fantastic Russian culture! You have a talent for capturing people and I like the history of the traditions, very interesting. you take such wonderful people shots! Super portrait and neat tradition.